We made it! The long cold of winter is over and another and much kinder season is upon us. Spring brings us so much relief, and depending on whom you ask that relief can take a lot of different forms. For a lot of folks, including me, a realfun signof spring is the return of America&apos;s pastime - baseball. Whether its the high school, college or professional ranks there is something about baseball that carries more with it than just the thrill of sport. Baseball slows down a time that often passes to quickly. Warm weather, great food and drinks and a leisurely day in the company of friends. A day at the ballpark is a great part of spring and, luckily, baseball is a huge part of Greater Lansing. Starting now you can get all kinds of baseball in your life and the only tough part is picking and choosing what you&apos;ll do. For the college baseball fan the defending Big Ten Champion Michigan State Spartans baseball season is underway and you can catch the action right on campus in East Lansing at Kobs Field. Go to the MSU baseball page on www.msuspartans.com to pick your game - one of many to come I&apos;m sure. Then just down the street in downtown Lansing you&apos;ve got one of the gems of the Capital City in Lansing Lugnuts Baseball. Tons of home games this year and lots of fun themed nights will have you going NUTS in no time. For something extra cool pay a little bit more (the tickets are inexpensive already so no worries my budget-focused followers) and go up to the Suite Level and the fun bar up there called the CLUBHOUSE. You can get a drink and pop out and watch the game from a fun perspective. I love it up there. See if you don&apos;t agree. Visit www.lansinglugnuts.com for more information. Then also because baseball is a very strategic and pretty cerebral sport I&apos;ve also got to mention an upcoming baseball-themed seminar sure to educate and entertain. Thursday April 19th at 7 p.m. you can check out &apos;A History of Baseball&apos; in the Auditorium of the Capitol Area District Library downtown at 401 North Capitol Ave, downtown Lansing. 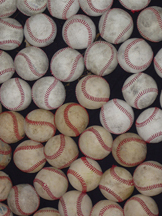 Nationally acclaimed baseball author Peter Morris will present a talk on the history of baseball in the State of Michigan forthe Historical Society of Greater Lansing and all those game to attend. Look, spring is here and so is baseball. There are so many ways to get out and enjoy it! Either watching it, learning about it, or even playing it at one of our many great parks, baseball facilities or natural areas. Heck we&apos;ve even got baseball going on at the library! Get out and get into some baseball!